What the Hell is a Consultationist? I, and many other who enjoy the English language, have been wondering which new words would be added to the lexicon of America. These new words, or neologisms, are usually chosen by a group of exudate linguists to be included according to the extent of pervasiveness of their usage. This begs an answer to today’s question: what the hell is a consultationist? Upon checking Webster’s and Harper Collins dictionaries, no reference is made for the noun consultationist. The closest reference is for consultation which we all know means an appointment or meeting to seek professional advice especially from doctors or lawyers. It is through this prism that the term consultationist has come into my practice universe and the lexicon of plastic surgery. Apparently in certain plastic surgery mass-marketing schemes, the number of patients seeking information is much greater than the doctors available to provide information thus leading to a new paradigm for plastic surgery practice by placing the here-to-fore unknown consultationist into the complex surgical information loop. Naturally, not every plastic surgeon answers every contact for surgical information, but we all provide detailed information to our office staff who field those questions from the public. The flow of accurate information through surgical surrogates called consultationists to the patient seems fraught with uncertainty proportional to the number of individual surgeons responsible for the information provided by surrogates. The information provided, by necessity, must be wholly generic in nature as no one but the plastic surgeon can provide the necessary depth of knowledge and experience to provide anything approaching a real consultation. These new plastic surgery mass-marketing schemes, in addition to spending millions of dollars on TV, radio, print, and internet, have actually added a layer of advertising bureaucracy as the information requests are funneled through a new layer of marketing specialists called consultationists. These new patient calls have become “sales leads” rather than actual consultations. This new marketing centered paradigm created a number of questions all of which surround the activities of the newly minted consultationist. For instance, who are these people, how are they reimbursed, what is their background and training, and who decides what they say and who do they report to: the physicians, marketing director, or corporate management, or all of the above? Is the protection and dissimulation of the brand primary or does accurate surgical information take precedence? Regardless of the answers to these questions, the marketing consultationist has added an entirely new level of bureaucracy that can only be financially justified if information requests turn into actual doctor consultations. Clearly it serves no purpose for any prospective patient to be denied a real consultation so the information flow through consultationists carries no more weight than any well-crafted patient directed web site. The web site will certainly answer the single most important question at any consultation: who is your doctor? It seems this one single question which would seemingly be the easiest to answer during any real consultation is usually the hardest question for a consultationist to answer generally depending on how many doctors are the recipients of this marketing service or sales lead. I’m not sure I have been able to actually answer my initial question: What the hell is a consultationist? My best research tells me a consultationist is but a cog in the marketing paradigm for certain large companies that endeavor to sell some kind of trademarked surgical procedure in some generic fashion. The challenge is to maximize the marketing of the procedure, even if the procedure is not proprietary or in any way original. The focus of the expert marketing must maximize the procedure and minimize the surgeon because each surgeon is an individual, but the procedure is universal and much more available as a marketing center piece. This type of marketing plan when well executed can be enormously effective unless the “generic” surgeon pool is depleted or becomes technically antiquated and changes do not keep apace the market for facial rejuvenation. Many of the predictable corporate problems are a result of the realities of size and success. Time will be the arbiter regarding consultationists. In the meantime, most of us plastic surgeons with integrity will try to muddle on without them. 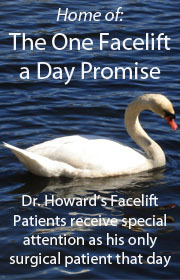 Read more about top face lift surgeon Dr. Paul Howard and his minimal incision, quick recovery facelift.